Today is the 142nd anniversary of the birth of Samuel Coleridge-Taylor! Coleridge-Taylor (1875-1912) was a British violinist, conductor, composer, and professor of part Creole descent. He learned to play violin as a child, and studied at the Royal College of Music in London as a young man. He went on to write a great variety of music, from solo piano pieces to songs, pieces for small ensembles, orchestra, and choir, as well as music for the theatre. His Hiawatha’s Wedding Feast for chorus and orchestra (1895) was one of the most popular pieces of music in England for several decades! Megan, this work is terrific.. Thank you. ???? to you, Ms. Jones! Thank you for all you do! 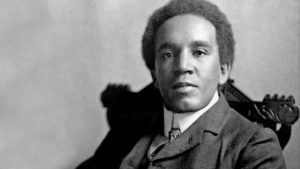 Samuel Coleridge-Taylor was one of the most popular English composer and conductor who was mixed-race. I am a biggest fan of Samuel Coleridge-Taylor.